Communication in soccer is an often overlooked area to coach your players on. There are simple ways to incorporate this into almost every drill, and even some specific drills to work on it. - To work on communication in soccer, number your players 1-8 in a circle. 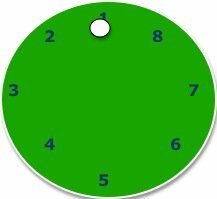 - Circle 7-10 yards in diameter, and have a ball with #1 player. - Players ALWAYS pass to the next number to theirs, 1 to 2 to 3 to 4 etc and 8 to 1 so the drill begins very basic. - You call out 2 numbers, those 2 players must sprint around the outside of the circle (in same direction) and stopping when they reach the opening created by the other number. - You can add in a mistake or errand pass results in push ups or sit ups, but keep them quick (possibly the number of the player in error). - Example: Players begin passing, you call out 3 and 7. Players must continue to pass until 3 sprints around ending in the 7 position, and the 7 player in the 3 position. Players keep their numbers, 1-8 but the ball will no longer be in a simple circle, forcing players to call for the ball and communication should start to improve. - Players CAN slightly delay their run until making a pass if necessary. - Passes should always be firm to feet. - Players should always be on their toes ready for the pass. - Players should call for the ball, AND call out who they are passing to. - Limit 1 touch only so they must weight passes and communicate even more. - 5-7 minutes for this soccer communication drill.